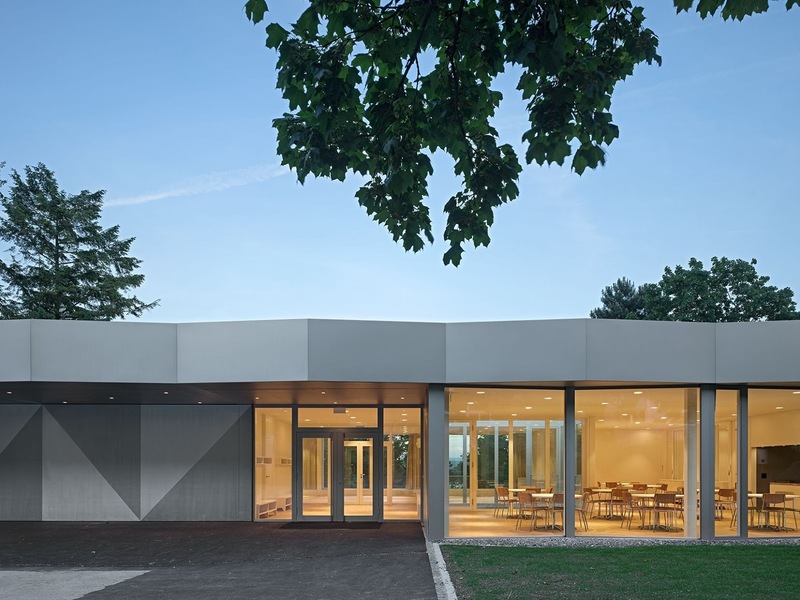 The existing primary school „Walkermatte“ is situated in a park-like landscape with old trees. 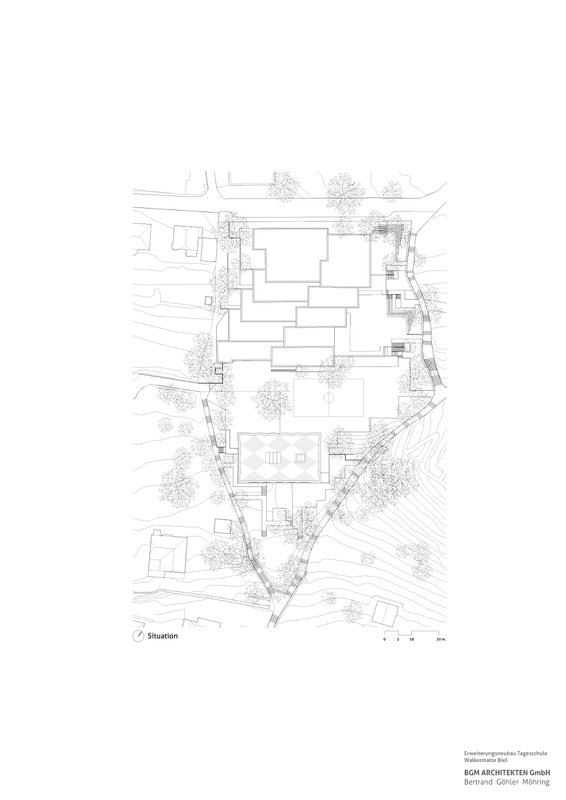 The site is located on the south-slope of the city of Biel which is characterized by its little surrounding space. A new day-school for 60 pupils was to be integrated in this narrow space. The day school accomodates rooms for the children who will be staying there throughout the whole day, as well as a multifunctional hall. 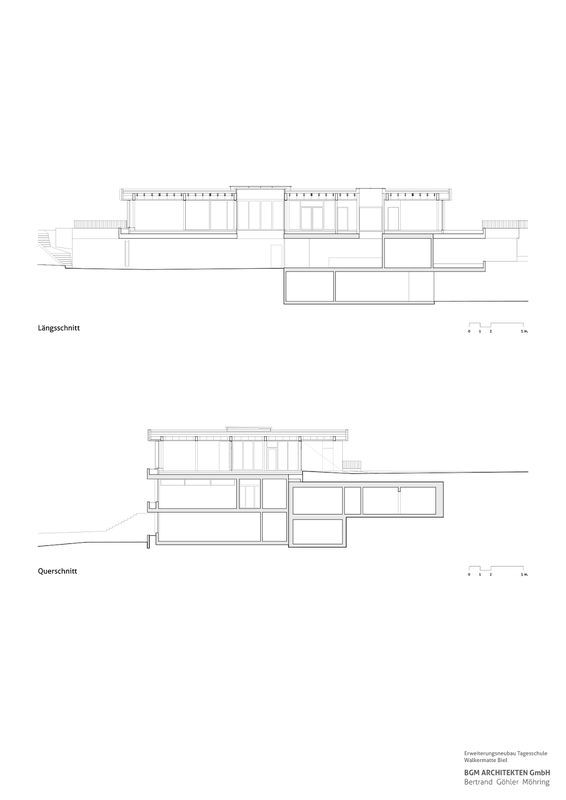 The new building therefore gets the identity- establishing and common center of the existing school. 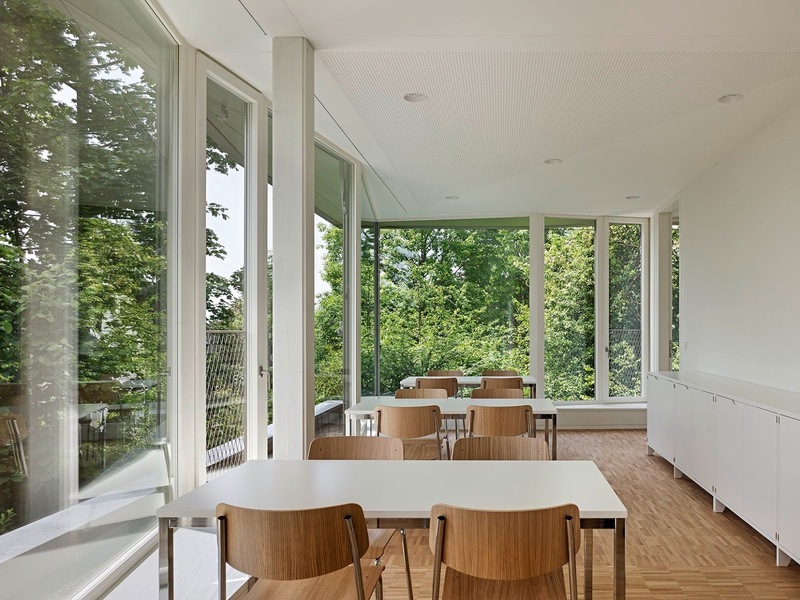 In order to implant the new building, the terrace of the schoolyard and the flat roof of the existing kindergarden, which has the same height as the schoolyard, had to be extended. This extension is the platform on which the new building was erected. Seen from the schoolyard the pavillon is a one-floor-building, but from the side of the valley it is the vertical additon of the existing kindergarden. 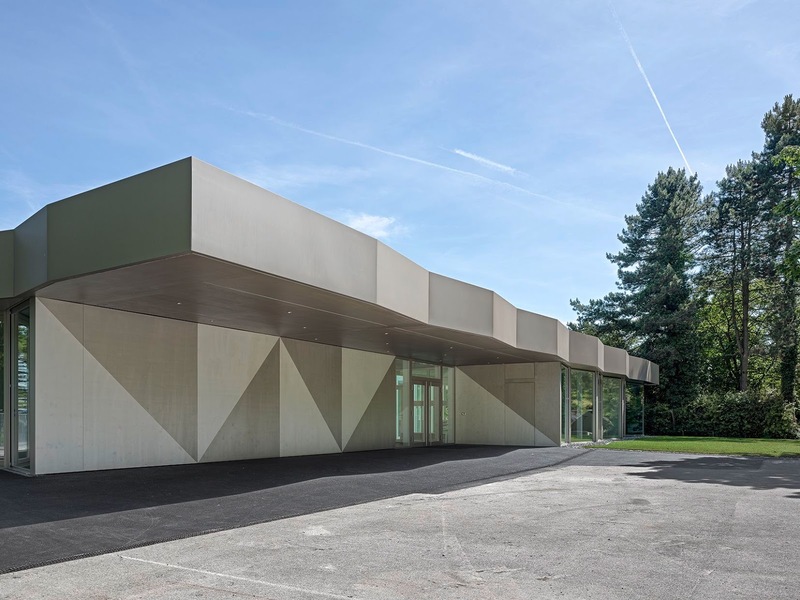 The volumious set-off of the entrance and its rear wall with wide coloured panels gives the pavillon its characteristic and a clear address. The rooms of the day-school are arranged around a central light areaway. 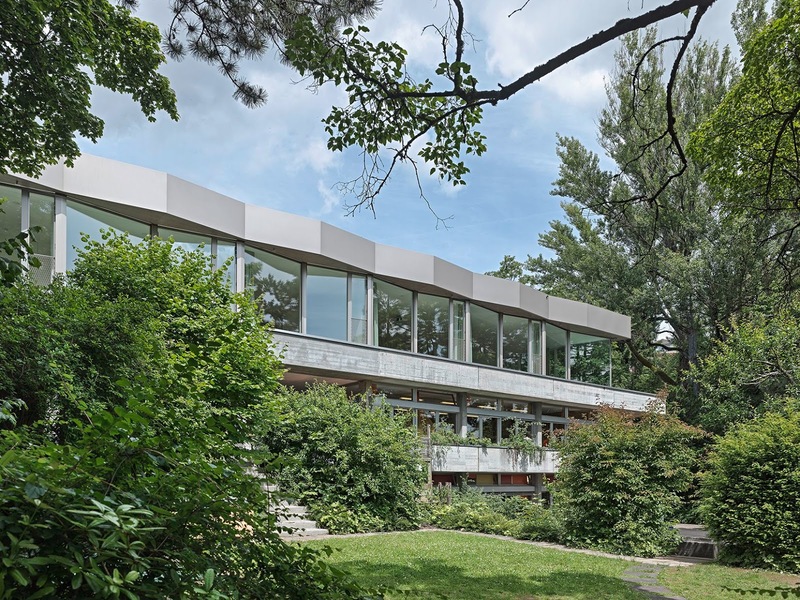 It is the heart of the house and allows various view-relations between several parts of the building, including the existing kindergarden below. The wooden structure of pillars and a grid of beams, which is the big roof, enable flexibility of the room layout. 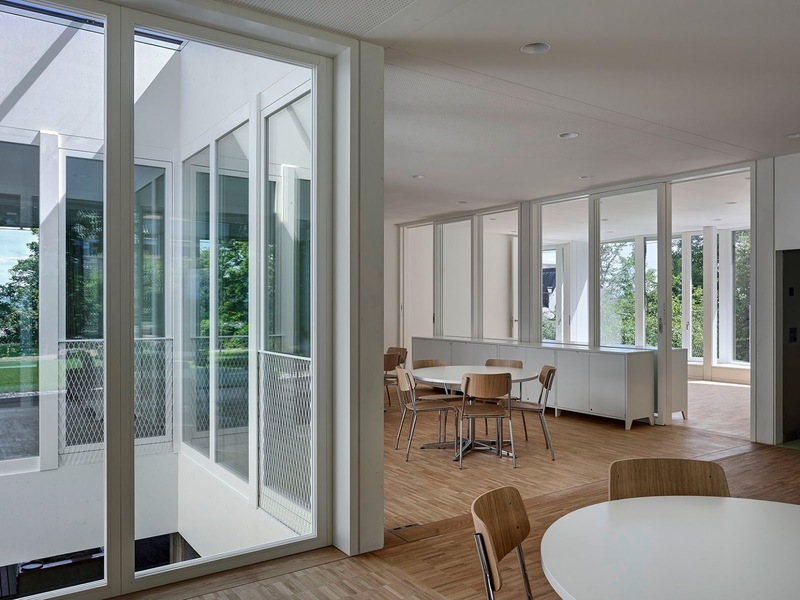 The rooms are usable in different ways and can adapt easily to the different needs of space of the school in the future. 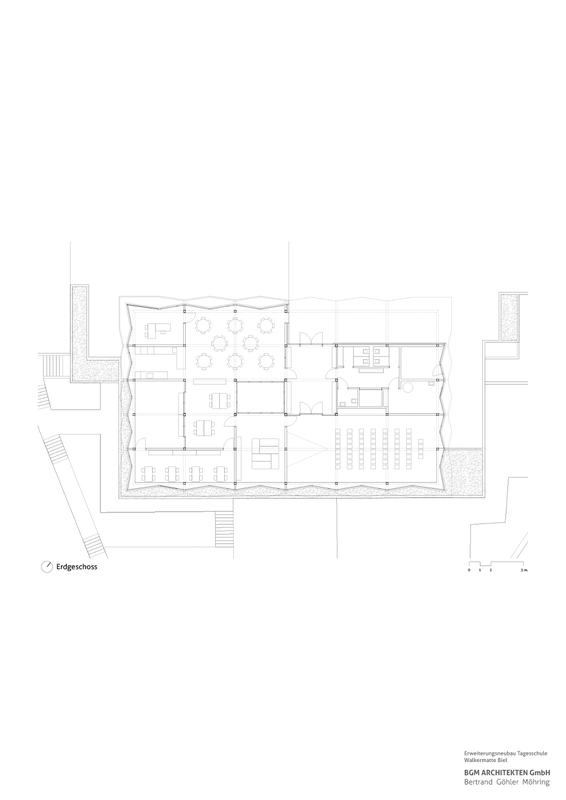 By adjoining the main rooms, a circuit like feeling is created and a flexible spatial arrangement is generated. 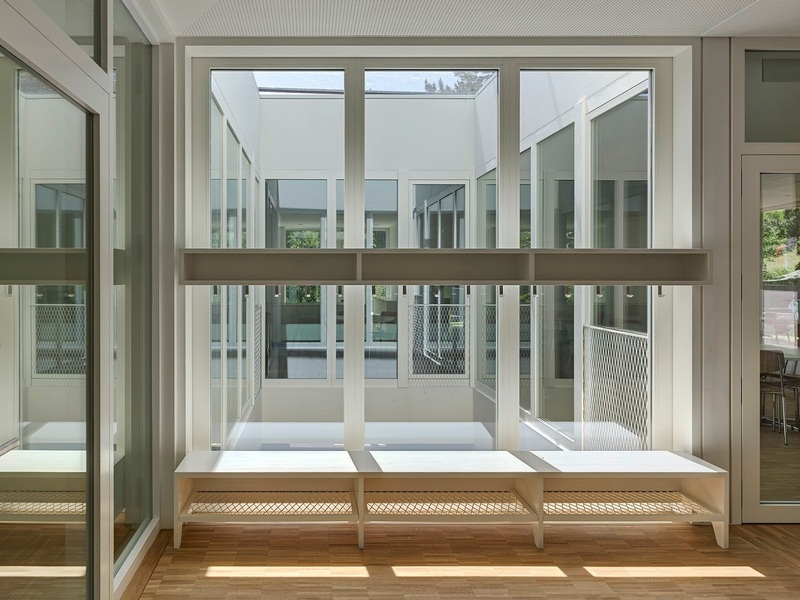 Depending on layout and position within the house, specific spatial qualities of an interior design are created. The athmosphere of the rooms is comparable to a living-room in a flat. All rooms are held in natural colours. The paintings and objects made by the pupils create a constantly changing colourfulness in the rooms. The folding of the facade breaks the reflections of the glass panels and sets the building back under the big roof. The reflection of the surrounding area is split into a variety of reflection pictures which seem to merge with the green of the surrounding park and trees. The folded edge of the roof and its material of coloured aluminium panels emphasise the autonomy of the new pavillon in contrast to the window sill girders out of concrete belonging to the existing building from the 1970s, without compromising the tectonic relationship between both. At sunshine the house changes its appearence through the on the outside installed textile sun protection. The changing sequence of vertical and extendible sunblinds turn the surrounding nature into an interplay of glimmering silhouettes and transparent images. 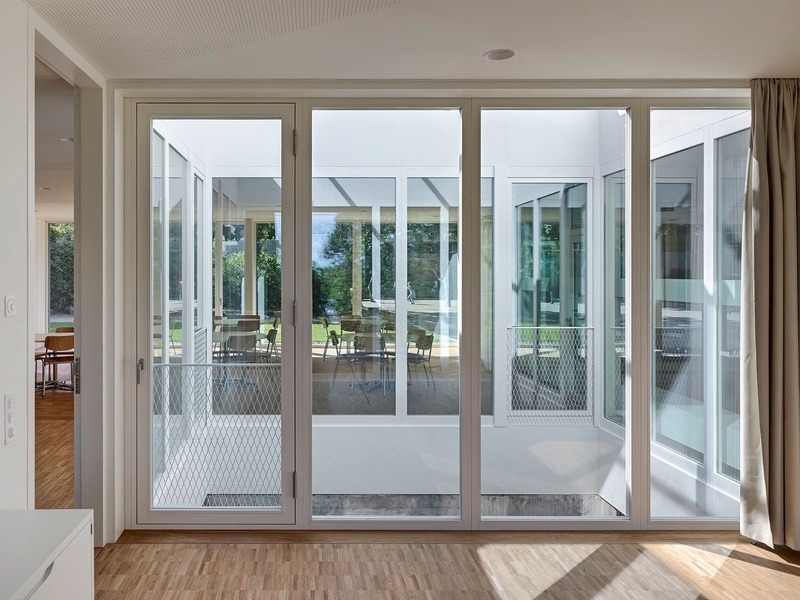 The strong relationship between inside and outside, which characterizes the house, is transformed into a new quality.